Thank you to our 2017 donors and sponsors, and to our government and foundation funding supporters! Your crucial support for our expanding publishing and outreach activities helps new eyes and ears discover the world’s most adventurous sound art and music. 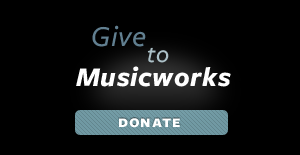 Musicworks magazine is published tri-annually by Musicworks Society of Ontario, Inc. Member of Magazines Canada and the Canadian New Music Network. Printed in Canada.